The stars of Pug Meets Pig are back, and while they’ve acclimated to sharing a home, they aren’t on the same page where Halloween is concerned. If possible, the pals are even more adorable this time around, thanks to their matching skeleton costumes. Pig adores everything about the outfit: its “snug fit,” glow-in-the-dark bones, and mask. “Will anyone know who she is?” wonders Pig with glee, mugging for readers with an expression that approaches ecstasy. But Pug is miserable in his costume, and after he tears it to bits, Gallion subtly explores how the two stay true to themselves, respect what the other needs, and find common ground (namely by getting really muddy and scarfing down Halloween candy). Wan’s art is almost impossibly cute, and the message about compromise is one for any time of year. 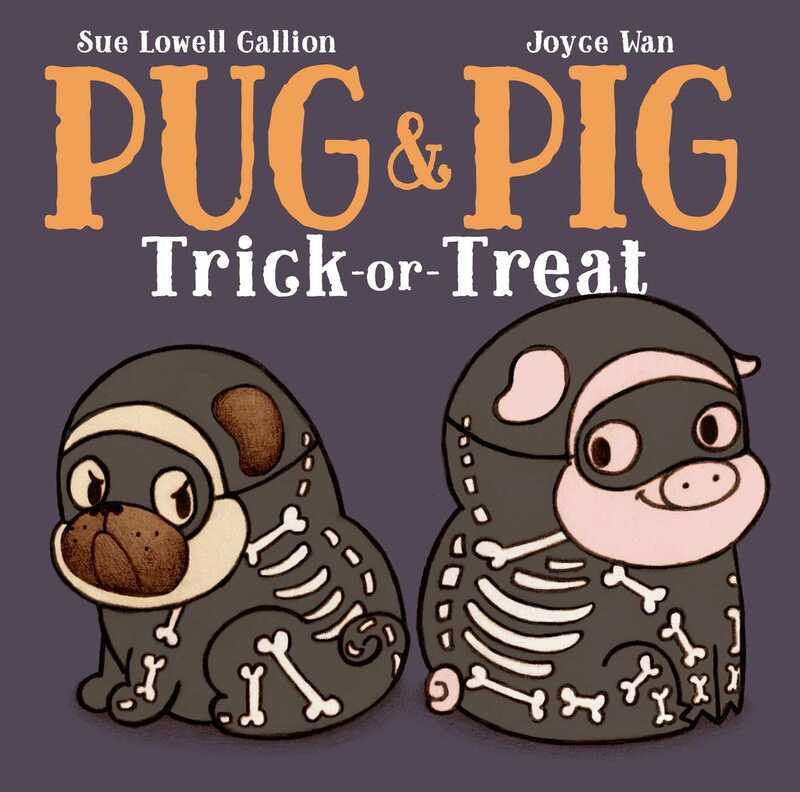 October 31 is here, and Pug and Pig are decked out in matching skeleton costumes. Pig couldn’t be happier, but Pug can’t stand the tight outfit, and he’s afraid no one will recognize him in his mask. He rips apart the costume, deciding that this holiday isn’t for him, but Pig is crestfallen at the prospect of celebrating Halloween without her pal. So Pug discovers a way to enjoy the festivities on his own terms. Coating himself with mud and calling himself Pig’s shadow, Pug feels much more comfortable and readily joins in the fun. Softly rounded illustrations complement the concise, matter-of-fact text. Roly-poly Pig and Pug are utterly expressive. Despite the appropriately dark palette, there are no frightening ghouls or goblins here, and cozy details abound, such as the decorative scarecrow (a sweetly smiling sunflower dressed in overalls) and a wreath festooned with a cheery little ghost. Children, especially those a bit apprehensive about the holiday, will applaud Pug’s solution and appreciate his willingness to seek a compromise. VERDICT A lovely addition to most libraries, especially for Halloween storytimes or where there are fans of the duo’s first outing, Pug Meets Pig.